Customer ratings and reviews increase conversion rates and revenue – but knowing where to display them is key. Being a web designer in Berlin isn’t easy, as there’s a lot of competition. Chris Hortsch has been successfully navigating the creative maze of the capital since 2004, first as a freelancer in web design and since 2011 with his own web design agency chris-and-friends. But he's not just into plain programming and website design; his aim is to highlight his customer's unique selling points - so that the end customer will do what Hortsch's customers want. He calls this "taking commercial initiative". Knowing how to display your business successes is part of this concept. Chris Hortsch finds that satisfied customers have an enormous influence on potential customers. When a ratings seal is strategically placed on a website, in particular, this increases the conversion rate even further. Taking commercial initiative, in other words. 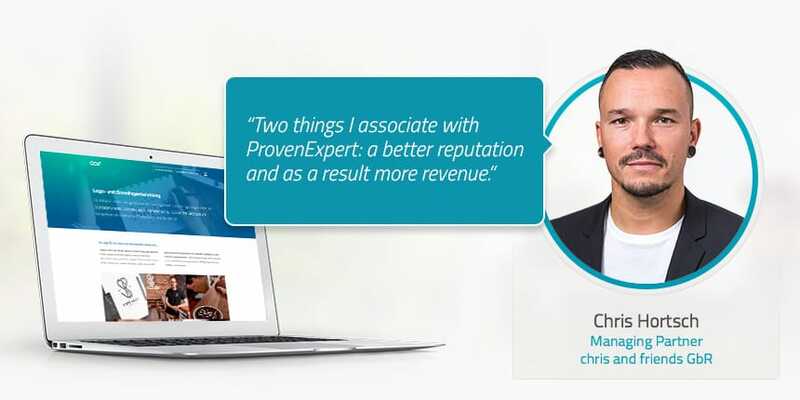 Before using ProvenExpert, did you collect customer feedback, and how did you use it? Yes, I had been collecting customer feedback for a relatively long period of time. But I was quite neglectful and approached it in a kind of old school way. When a project was finished, I’d write to customers saying „"Hey, how was the project for you - could you write a couple of sentences about your experience?"“. I then programmed that into my site and published it online. But it terms of authenticity, it wasn’t great, since anyone can write references for their own website. So I started looking for a tool that would enable me to work with and display customer feedback in an authentic way - that showed it was genuine. Do you use other portals in addition to ProvenExpert? Not really. The only one I am at all active with is Google My Business. When I become aware from talking to a client that they want to rate me, I’ll send out the link to my My Business Account. I’m always happy to do that, and that then brings in ProvenExpert too. Why did you decide to start actively collecting customer feedback? I’ve found that customer feedback gives me the advantage because I’ve received more new customer enquiries on the back of existing feedback. I think that people feel more secure because my business is more transparent this way. You’re in a better position when you actively ask customers for feedback. It elevates your business. What are your expectations and goals when it comes to using ProvenExpert? ProvenExpert is definitely a good way to boost your business reputation. And what’s good for your reputation is also good for your revenue. They pretty much go hand in hand. Those are the two things I associate with ProvenExpert: enhanced reputation and increased revenue as a result. I try to integrate the widgets provided by ProvenExpert into locations on my website that are most relevant for conversion. I act with customer turnover in mind, while considering the impact on my own site too. For instance, I have a contact form built into my website and I’ve included ProvenExpert directly in the call-to-action. The ratings seal with the number of customer ratings and the average rating is displayed there, and beside it the inquiry button for my site and my services, which customers can then click and access. So I would integrate the seal not just as a matter of fact - but integrate it in a way that’s relevant to conversion. What do you see as the greatest added value of using ProvenExpert in comparison with standard ratings portals? 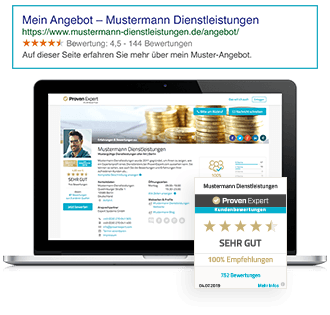 One thing I always recommend to others as a particular advantage of ProvenExpert is the ability to aggregate reviews. As a rule, people can rate you anywhere online, and that’s exactly what they do - sometimes without my knowledge. And the fact that you can combine all this feedback and publish it as an aggregated score is a huge benefit. My customers to whom I’ve recommended ProvenExpert see this as a major bonus too. ...that you have a clear overview of everything? 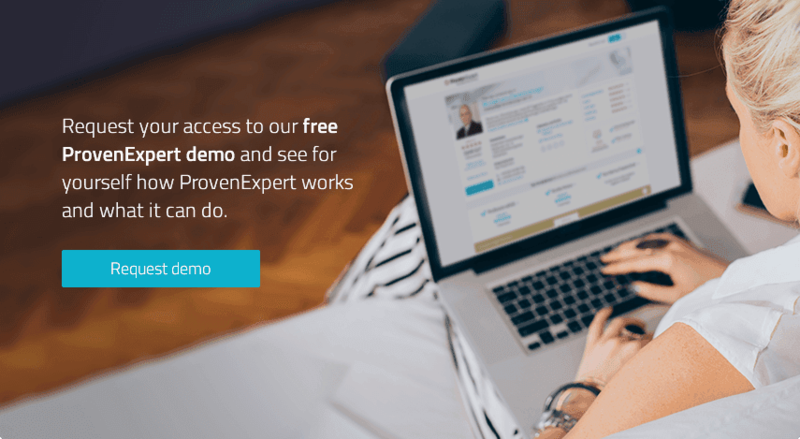 Have you won new customers through using ProvenExpert? It’s hard to say yes specifically, because it’s difficult to track or account for. But I can say with certainty that I’ve won or started new web design projects thanks to ProvenExpert. A good customer evaluation management system definitely increases your conversion rate, and your turnover as well. Have you had customers who have said they’ve come to you because of your ratings? Yes. Lots of new customers have said they’ve approached me upon recommendation. And when I have asked them specifically „“who recommended us to you? "“, it often emerges that a recommendation doesn’t necessarily come from an existing customer of mine, or an acquaintance of theirs. Rather, they mean that it's because of our ratings, rather than a personal recommendation, that they're coming to us. How have your customers reacted when you have approached them for feedback? Around half of my customers respond to my feedback requests. How do your customers react to feedback invitations? They react positively, that’s for sure. Some just leave a star rating, others leave a written review. I don't specifically request they leave comments. However, hardly any clients leave five stars without writing at least a sentence too. That's all totally unprompted. Do you look forward to reading a rating when you receive a notification about one in your inbox? I look forward to each rating, without exception. Yes, I can say that. It never becomes routine. Have you been able to pinpoint some strengths and potential areas for improvement as a result of online surveys? Yes, I think so. For instance, I've noticed that people have rated me for my work even before they become a customer. It's a nice validation for work that's already been done - i.e. it's feedback on a standard first consultation. So I take this on board and want to strengthen this step of the process in future. Is there anything you want to tell us right now? I think it's good that people can use your rating and review management tool to make content that was previously anonymous public and display it in a transparent and authentic way. Plenty of web designers put up „"thumbs up" images“ on their websites without a face or name for their source. I'm into transparency, so I do things differently. I also think it's good that ProvenExpert works on developing its own brand. After all, I'm integrating the ProvenExpert brand into my own website. It's about my name, the „impression“I create, „me“. On my website there is no outside content, apart from ProvenExpert. Any brand that I consider displaying on my website needs to ensure a minimum level of focus on its own reputation and the impression it creates before I will integrate it into my own website in the way I do right now. ProvenExpert does this, and it does it well. Thanks for this frank discussion!